Boston ; New York : Houghton Mifflin Harcourt, 2016. "Hochschild narrates such tales with prose that is consistently vivid yet emotionally restrained. His main contribution is to retell a familiar story with a focus on Americans and an unromantic assessment of why the “good guys” lost, so that he adroitly evokes the commitments of Americans on both sides while eschewing any retrospective cheerleading for the Republic." "Hochschild is an exceptional writer; his narrative is well-paced, delivered in clear prose, and focused on important and colorful details of the historical moment. Volunteers from around the world....saw the Republican cause as a last-ditch effort to stop fascism before it spread across Europe, and Hochschild tells their story beautifully." "...somehow I managed to say kaddish for this son, brother, uncle. All this brought up enormous emotion. It hardly seemed just my own, or my family's. It felt part of a universal sorrow for the human struggle that played out in Spain during those dark days that were just the beginning of the trauma and tragedy that overcame all of Europe and throughout the world..."
This book is the story of the American men and women who volunteered in the Spanish Civil War. Hochschild did a tremendous amount of research for this book, bringing alive these people through their letters and diaries. He also draws on the reporters and writers who were there; and we learn about the inspiration for [For Whom the Bell Tolls]. The use of letters and diaries really bring the people to life. He also does a great job of putting the struggle in context. He addresses questions of whether WWII would have occurred if the Allies had helped the Republic and whether the Republic would have become a satellite of the Soviet Union. We all know how it ends, yet as I finished this book, I had tears in my eyes, saddened that the idealism of the men and women who volunteered was not supported or honored during their lives. It's also sad to see that many things don't change; governments are still run by expediency rather than by morality. Franklin Roosevelt, whom I admire, knew it was right to support the Republic, but didn't want to lose voters. Media didn't tell the whole story, and corporations - Texaco here -- made a lot of money off the suffering of others. So, this story is relevant. Best known today as that war Hemingway wrote about in [For Whom the Bell Tolls], the Spanish Civil War was conscientiously ignored by much of the world. For many who do know of it, it's seen as a minor prelude to World War II. It was more than that, as Adam Hochschild explains in [Spain in Our Hearts]. For Germany and Italy, and to a lesser extent the USSR, it was a testing and training exercise for war to come. For Britain, France, and the US, it was a blown opportunity. For the Spanish, it was a catastrophe, of course; by 1939, the war was over and 36 years of vicious totalitarian rule was beginning. As 1936 began, Spain was effectively a feudal society. Wealthy industrialists, landowners with holdings sometimes exceeding 75,000 acres, and the Catholic Church were the country's powers. But elections in February unexpectedly turned the government over to the Popular Front, a coalition of liberal, socialist, and communist parties. Less than 6 months later, martial law was declared in Melilla, a city of Spanish Morocco, by the Spanish Foreign Legion. According to Hochschild, the "key plotter" was General Francisco Franco. "Ambitious and pu­ritanical, an architect of the elite Spanish Foreign Legion, he was driven by a fierce belief that he was destined to save Spain from a deadly conspiracy of Bolsheviks, Freemasons, and Jews (no matter that King Ferdinand and Queen Isabella had expelled the latter from their realm in 1492, during the Inquisition, and that few had ever returned)." By autumn the Soviet Union was not just quietly selling the Re­public arms, but also sending military advisors, pilots, and tank crews. Eager to make use of the tremendous sympathy for the Republic among leftists throughout the world, the Communist International, or Comintern, through which Stalin controlled Communist parties in other countries, passed the word to begin recruiting special bri­gades of volunteers to help fight Franco. Citing an overriding focus on the Great Depression, FDR kept the US government from getting involved. As the war continued, and as he was besieged by anti-Franco partisans, FDR hid behind the threat that the Catholic vote would turn him out of office. 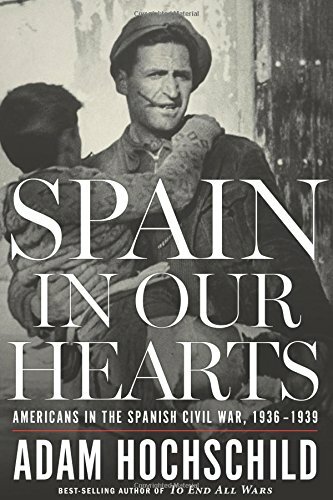 Hochschild notes that "[w]hen running for reelection in 1936, FDR was believed to have quietly promised the American Catholic leadership that he would not take sides in Spain." Blaming the Catholics was convenient, he adds, "because the liberals pressing the president to sell arms to the Republic were will­ing to believe anything ill of the Catholic Church, as were Roosevelt's fellow upper-class WASPs. 'Dammit... if I lift the embargo,' FDR said to one person who came to lobby him for the Republic, 'the Catholics will crucify me!' "
The shocking aspect, to me, was that quite a number of America's big international businesses sided with Franco. Texaco in particular supplied all of Franco petroleum needs ON CREDIT. "By US law," Hochschild writes, "the export of 'arms, ammunition, and implements of war' to other countries at war was prohibited. Early in 1937, a congressional resolution made clear that any weapons destined for 'the unfortunate civil strife in Spain' were included in the ban." Texaco skirted the ban by double-manifesting oil shipments on its tankers. They'd leave port in the US with a shipment ostensibly going to some non-warring destination, then unseal the manifest for the true destination once the tanker was in international waters. In addition, Texaco, through its European sales apparatus, collected information on shipping by rivals and forwarded details to the Nationalists (Franco's forces). Ford and GM, with manufacturing plants in Europe, supplied vehicles to Franco, but not to the legitimate government. Firestone supplied tires. Repercussions for these businesses were nil. Over the course of the war Germany alone would send Franco antiaircraft batteries that helped cripple the Republican air force, the newest field artillery, some 200 tanks, and more than 600 military aircraft. Most equip­ment was of the latest models, since the Wehrmacht was eager to try them out in battle. Altogether, some 19,000 German troops, aviators, instructors, and advisors would see action in Spain or take part in training thousands of Nationalist officers and NCOs…. emsp;Mussolini's airplanes were less advanced, but he would send the Nationalists 762 of them by the war's end, as well as 1,801 artillery pieces, at least 149 tanks, 223,784 rifles, 3,436 machine guns, and large quantities of bombs and ammunition. Nearly 80,000 Italian troops would eventually fight for Franco. Hitler especially reaped great rewards for his assistance. The greatest aid Spain provided the Nazis, however... [was] the wealth of experience that German aviators and other military men gained in nearly three years of the civil war. Twenty-seven different models of Nazi aircraft were tested in Spanish skies. As air force chief Hermann Goring later put it when on trial at Nuremberg, the Spanish war was an opportunity "to test my young Luftwaffe. ... In order that the personnel, too, might gather a certain amount of experience, I saw to it that... new people were constantly being sent and others recalled. In the end, the Nationalists crushed the Republicans. Texaco, GM, Ford, and other American companies got paid. The German Luftwaffe used its experience in crushing Poland, in overwhelming the Netherlands, Belgium, France, and in besieging Britain. Hundreds of thousands of Spaniards were killed in the aftermath, and the nation was plunged back into feudalism until Franco's death in the 1970s. This is well written and easy to read book that covers in narrative form the history of the Spanish Civil War. We see history unfold through the eyes and experiences of various Americans who participated on both sides of this conflict. I have a better understanding now why most western countries did not support the democratically elected government which was at the time of the revolution were communist and the military coup of the nationalist which were supported by Hitler and Mussolini.